Well hello there beauty lovers of the world ... oh, how I seem to be writing the same introduction to every single blog post recently but ..... I miss blogging! I'm sat here now and loving the fact I'm here on Blogger typing away - I'm just struggling to find that time to delve in. But I'm here... so let's get on with it! Coffee body scrubs seem to be EVERYWHERE right now and after hearing great things about them (and seeing some fabulous blogger selfies covered head to toe) when I received the opportunity to give it a go from Scrub Love I couldn't say no! 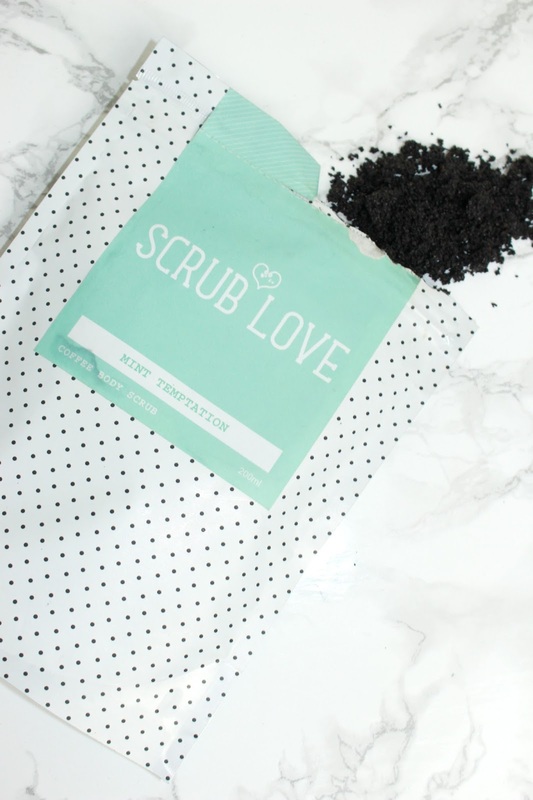 Scrub Love is a 100% natural and organic coffee scrub and this one in particular is Mint Temptation ... tempting eh?! First up let's talk about the scent.... woah mumma it is strong! If you're not a coffee/mint person... this is not the product for you... #SozBabes. I decided to grab a handful in the shower to spread across my body and cor blimey it was a bit overwhelming..... baby portions from now on for sure! Scrub Love scrubs are said to treat everything from stretch marks to psoriasis.... so as you can imagine I was excited to give it a go. Combined with rich oils and rock salt the crushed coffee beans release caffeine which is absorbed into your skin when mixed with water - increasing circulation and delivering some good-old antioxidants! As a scrub this stuff is absolutely brilliant, my skin was left feeling softer than it has in forever, I was so impressed and the sore, dry patches I have on my legs (which could be eczema I'm not entirely sure) felt so much better! All in all I'm so impressed, each packet is resealable which is perfect for me as I've only been using it once a week and as you only need a tiny bit I know this is going to last a good while! Want to know more? Check out the Mint Temptation Scrub Love - here. I've been seeing these around and they sound fantastic! I've seen these and am intrigued but I like neither the taste nor smell of coffee - I'm paranoid it will smell very strongly.